Many Sierra Leoneans at home and abroad, who were once admirers and supporters of president Koroma, are now dumb struck by the alarming ‘Jekyll and Hyde’ manner, with which the president has transformed himself into a brutal dictator. Today, Amnesty International says politically motivated violence must stop, in the West African nation, crippled by the Ebola virus and a government that itself has become consumed by its own slothfulness, poor governance and corruption. Last month, campaigners for the reinstatement of the sacked vice president were violently manhandled and arrested in their homes by the police in Freetown. 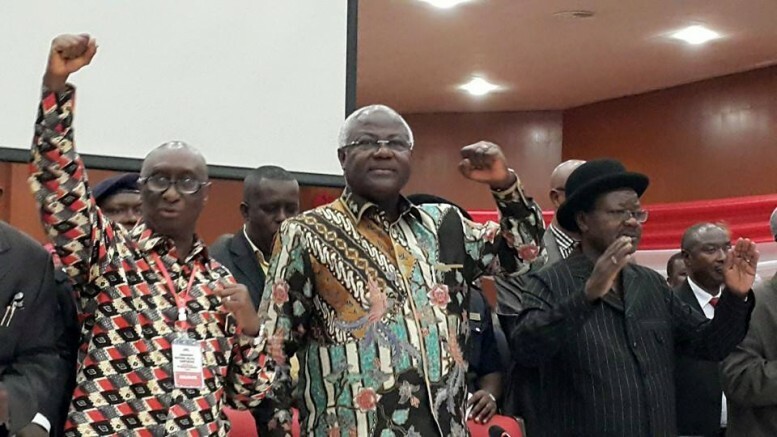 In March, lawyers campaigning against the unconstitutional actions of president Koroma were violently dispersed and a senior barrister arrested. In April, a handful of members of the opposition SLPP gathering at the residence of a local party member, were arrested and are believed to be incarcerated at the Pademba Road prison. Last week in Kenema – an opposition SLPP stronghold, heavily armed police unleashed violence on demonstrators protesting the president’s abuse of power and unconstitutional behaviour. The director of the country’s human rights group was arrested and several people hospitalised by injuries inflicted by the police. Amnesty International is calling on president Koroma to stop the abusive implementation of the Ebola state of emergency powers as a political weapon. In 2014 and at the height of the Ebola crisis, parliament granted president Koroma sweeping State of Emergency powers, which most Sierra Leoneans now believe are being used not for the controlling of the transmission of Ebola, but for the indiscriminate arrest and harassment of the opposition. “Now that Ebola cases are reducing and schools have re-opened, the government should immediately review the State of Emergency provisions and ensure that only provisions strictly required to fight the Ebola epidemic remain in effect. Rights to freedom of expression and peaceful assembly must not be unnecessarily or disproportionately curtailed, ’’ said Sabrina Mahtani, Amnesty International’s West Africa researcher. Today, Amnesty International says that Ebola regulations and other laws must not be used to curtail freedom of expression and assembly. The government of Sierra Leone should stop using emergency regulations brought in to combat Ebola, as a pretext to restrict freedom of expression and peaceful assembly. The call comes following an increase in arrests of opposition members, bans on peaceful protests and an unwillingness to tolerate dissent that has heightened following the removal of former Vice President Samuel Sam-Sumana on 18 March. Even though cases of Ebola have sharply reduced in Sierra Leone, State of Emergency measures have been increasingly used alongside other laws to stifle criticism, some of which are thought to be linked to the removal of the Vice President. On Sierra Leone’s Independence Day, 27 April, 15 members of the main opposition party, Sierra Leone People’s Party (SLPP) and a Senior Officer from the Human Rights Commission of Sierra Leone, were arrested in Kenema (East) and are currently on trial. There are concerns about excessive use of force by the police with several people injured. A march organised by the Sierra Leone Association of Journalists on Independence Day in Freetown was also banned. Eight days earlier, 10 people were arrested for protesting outside the US Embassy, while in March a meeting of the Bar Association was broken up. In contrast, assemblies and events held by the governing party have been allowed. In November 2014 a journalist was detained for 11 days for criticising the Ebola response, and in April 2015 eight people from Kono were detained for six months without charge following disorder linked to a suspected Ebola case. Last month a man was charged with insulting the President after having forwarded a Whatsapp message he did not author. In all of the cases, apart from the latter, State of Emergency powers were cited as reasons for police action. “All restrictions on human rights under the State of Emergency and other laws must be in accordance with international law and standards, and not be arbitrarily or discriminatorily applied. Certain rights, such as the right to a fair trial or prohibition against ill treatment, cannot be derogated even during a State of Emergency. The focus must be the fight against the Ebola epidemic and not stifling of dissent,” said Sabrina Mahtani. Amnesty International calls on the government of Sierra Leone to urgently review the State of Emergency provisions and to ensure that everyone can exercise their rights to freedom of expression and assembly in conformity with international and regional human rights law. The organization also calls for an independent and impartial investigation into the allegations of excessive use of police force in Kenema on Independence Day. (END). The president is now becoming a serious liability and a millstone around the necks of Sierra Leoneans. He and his cabal have to go. However I disagree with Mr Jalloh in the video that Ernest Koroma is being corrupted by the IG Munu. Ernest Koroma had all the tendencies from the very beginning to become a dictator and was corrupt even before he assumed power. But people were so hell bent on bringing this man to power and so missed the tell tale signs. When he was elected, he flatly refused to declare his assets. Alarm bells started ringing very loudly for me then. I was on a ferry once when the president was also travelling to Lungi. Cars were not allowed to go on the ferry and we (the passengers) had to leave our cars behind for the president’s 20 car convoy to get onboard. I watched his interaction with the public and it was so obvious that he was a megalomaniac. He is the president and so the buck stops with him. I blame him entirely for the attacks on Human Rights activists in Kenema. Munu, should be man enough to refuse to attack innocent civilians on the command of the president. As a Sierra Leonean we should all be worried about what Ernest Koroma and our APC are doing to our people. Those of us who believed and trusted that EBK is a democrat were so wrong about the man. Now we know that he is worse than those we removed from office in 2007. Thank you Mr Jalloh for speaking out, and I hope our sycophantic brothers and sisters in the party will realise that the peace and security of ALL saloneans must come first before party loyalty. A politically oppressed Sierra Leonean, be it in Kenema or Makeni, must not be condoned, for we are ALL Sierra Leoneans. WE must ALL stand up against tyranny and lawless behaviour of those in power. It’s a video from a heart for your country. I would happily make a similar passionate call for Sierra Leone if the merits so abound. The only point I reserve is, unlike you, I couldn’t establish the basis, since all that can activate such a video response from me would be non-objectionable facts of the issues raised and nothing less. However, as I said, I may not be privy to the facts as you could have been. Where the latter is certain, do accept my sincere thanks for speaking my heart and mind. It’s so encouraging to see sons and daughters of our beloved Sierra Leone take personal, the issues that affect our collective growth and development, based on our unity as a nation. Be well.